Ginger root is a delicious herb that has powerful medicinal properties. Fresh ginger root, dried ginger, and ground ginger powder all have anti-inflammatory, antimicrobial, and anti-spasmodic uses in natural medicine. You can eat raw ginger or drink ginger tea to help prevent and treat nausea, improve your cardiovascular health, and boost your brain function. You can get the many health benefits of ginger root if you add fresh, minced, grated or ground ginger to your diet. You can use fresh or ground ginger to make a therapeutic ginger tea. Or, you can chew on fresh ginger to help relieve nausea. Also, adding ginger to your cooking doesn’t destroy many of its therapeutic properties. In this article, I will look at what science says about the true health benefits of ginger. You will also find out how to make your own ginger tea at home that you can enjoy at any time of the day. To benefit from the medicinal value of ginger (botanical name is Zingiber officinale), it is important to know which the best kind of ginger to use is. The good news is that both fresh ginger and ground ginger powder have many health benefits. Studies have also shown that boiling or roasting ginger for between 2 and 6 minutes actually increases the antioxidant potential of ginger. (4) This is something I’ve already mentioned when I wrote about the benefits of cooked and dried ginger. So, you should not be overly concerned about the difference between using fresh or ground ginger for its health benefits. Ginger root is good for you because it contains vitamins and minerals as well as antioxidants. Let’s look in more detail at the many health benefits of ginger tea, consuming fresh ginger root, or taking powdered ginger capsules. Reducing inflammation is an important health benefit of taking ginger root or drinking ginger tea. If you suffer from forms of arthritis, ginger root capsules can help to reduce your symptoms. You can also add grated ginger to your diet by adding it to salads, using in a stir-fry or adding it to hot water to make an anti inflammatory ginger tea. Find out about other foods that can reduce inflammation and may reduce arthritis pain. The pain-relieving properties of ginger tea can also help to reduce pain, especially muscle pain after exercise. You can also find out how to make your own pain relief ointment using essential oil to help reduce muscle pain. The anti-spasmodic properties of ginger tea can help to relieve abdominal pain associated with menstruation (dysmenorrhea). Find out about other home remedies that are effective for period pain and abdominal cramping. Consuming more fresh minced ginger or drinking ginger tea can help to improve your digestion. Indigestion is often accompanied by heartburn (acid reflux) and excess gas. If you regularly suffer from heartburn, you can try one of these natural antacids for quick heartburn relief. One of the most well-documented uses for ginger root or ginger tea is to prevent nausea and digestive upset. Did you know that ginger is just one of many natural remedies to relieve nausea? Ginger tea also has a positive effect on your immune system and can help you fight infections better. As soon as you feel you are coming down with a cold or have the flu, drink ginger tea regularly to help boost your body’s defenses. Learn about other herbs and supplements that can boost your immune system. Regularly drinking ginger tea is good for high blood pressure because of the flavonoids and other antioxidants it contains. If you need to treat hypertension, make sure that you have made these lifestyle changes to lower blood pressure. Another of the benefits of consuming more ginger tea in your diet is that it can help to reduce levels of LDL cholesterol. Chewing ginger root can also help to prevent a buildup of plaque in your arteries. The above study also found that ginger benefits vascular health because it may prevent a buildup of artery plaque (atherosclerosis). Find out other foods that help to prevent blocked arteries. Ginger extracts or ginger tea can benefit you if you suffer from diabetes because they may help to lower fasting blood glucose. Learn how to spot the warning signs of diabetes and what foods you should eat to lower your risk of type 2 diabetes. Ginger tea can also protect against cognitive degenerative diseases due to its powerful antioxidant effect on the brain. It is not just ginger that helps to improve brain health, did you know about the other herbs that can improve your memory? The antioxidant properties of ginger mean that consuming ginger tea has a positive effect on your liver. It is not just in laboratory trials that ginger has proven to be good for promoting liver health. Find out how to use other foods and herbs to keep your liver healthy. Drinking ginger tea can help you lose weight and even help prevent obesity. Of course, ginger isn’t a wonder remedy that will in itself burn fat. However, studies suggest that using ginger as part of a wider weight-loss program could help you lose weight quicker. Learn about specific ways that you can use ginger to get rid of unsightly belly fat. One of the uses of ginger root or ginger tea is to help reduce inflammation and spasms in the airways. You can use fresh and dried ginger to help improve bronchial symptoms of asthma and respiratory infections. If you suffer from asthma, find out what other natural remedies can help relieve asthmatic symptoms. Ginger root and ginger tea have anti cancer properties because of their powerful antioxidant compounds and anti-inflammatory properties. The British Journal of Nutrition published the results of an American study in which ginger extract (zingiber officinale Roscoe) inhibited growth of human prostate cancer cells. Angiogenesis is the term that describes the start of cancer. If you can stop cancer from taking hold in the ovaries then you can effectively prevent cancer. In 2015 scientists presented evidence that ginger may prevent colon and liver cancer. Although there are many promising results in using ginger as a therapeutic cancer treatment, it is still too early to say exactly how ginger can be used to treat cancer in humans. It is extremely easy to get the benefits of ginger tea to help boost your health, relieve nausea, and prevent coronary heart disease. You can make ginger tea using fresh ginger or ginger powder. Chop or mince a 1-inch (2.5 cm) piece of ginger root (if you leave the skin on, wash the ginger root thoroughly). Put in a cup and pour in boiling water. Leave to infuse for 5 minutes to extract the healthy compound from the ginger. You can optionally add a teaspoon of raw honey to taste. Drink ginger tea 2 or 3 times a day for best results. Remember, don’t throw the ginger slices away. You can chew the ginger slices to help improve your digestive health and get even more of the ginger benefits. Put a 1/2 to 1 teaspoon of ground ginger in a cup. Pour over boiling water and stir well. Add a teaspoon of raw honey to taste. 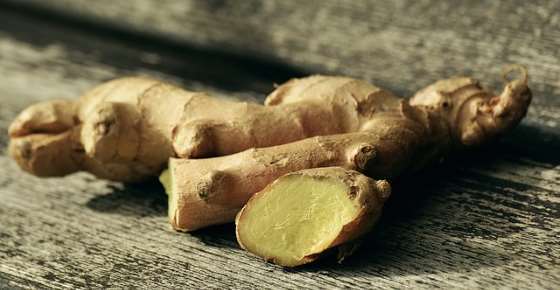 Drink 2-3 times a day to help get the benefits of ground ginger powder. Put a piece of grated ginger or ginger slices into your smoothie before blending. Add chopped ginger root to a stir-fry. Mince ginger and add to a healthy salad dressing to spice up your salad. Add a teaspoon of dried ginger to sauces while cooking. How Much Ginger Should You Consume? Ginger is so concentrated with active ingredients and it means you don’t need to use much of it to enjoy its health benefits. As for nausea for example, ginger tea with 1-2 inches of fresh ginger in hot water may be all you need to calm the stomach. For rheumatic arthritis pain you need even smaller amount of ginger in food or in your ginger tea each day. People who consumed larger amounts of ginger reported rapid and better relief. How to Buy and Store Ginger? When you buy ginger, make sure that it is stiff to the touch and has smooth skin. Young fresh (and organic) ginger doesn’t require peeling of the skin and can be grated as it is. However ginger that was left on the shelf for a long time will have a hard skin that needs to be peeled, and it will also be more fibrous. You can store fresh ginger in a cool dry and dark place up to three weeks when it is not peeled, or in the freezer for up to six months. Dried ginger powder should be stored in sealed glass jar in a cool, dark and dry place. If you keep it in the refrigerator, it will extend its shelf life for up to one year. Combining the benefits of both ginger and lemon is not only tasty, but a winning combination for great health (you can check out my article about the health benefits of lemon water). This recipe is taken from my e-book The Detox Guide that teaches you about the concept of detox and how to use detox to cleanse and energize your body. Finely chop ginger root and infuse in freshly boiled water for 5 minutes. Add lemon juice, stevia or honey and stir. Serve hot or cold for a refreshing and revitalizing treat. Many people can experience improvements in health by using ground ginger in food or as a dietary supplement, but it’s not the right choice for everyone. There are certain groups of people that should avoid ginger consumption as it can interact with other medication and can worsen certain health conditions. You can read about in the related article: “Ginger Should Be Avoided By These People“. I use between 5 and 7 lbs. of fresh ginger a week. I slice it up like chips and eat it that way. followed by lots of water! its so refreshing to me. I buy it at a local Asian market. the stuff in regular grocery stores is usually never very fresh. if the skin is not too bumpy or rough, I eat it with the skin on. the ginger with shiny skin turns out too bitter for me. and ‘baby ginger’ is the best! I don’t see that too often, though. I cut the the fresh ginger in small pieces and chew them followed with a glass of warm water.its feels great.. I am suffering from hypothyroid for last 20 years. Recently I started using ginger daily chewing small pieces every 2 hours. All the symptoms and problems of thyroid are disappeared completely and my health become very normal. My cholesterol, renal, thyroid and diabetes profiles turns out normal. Gave me lots of energy and made me active again. Ginger is like nectar to me. I recommend everybody to start using this very cheap herbal remedy cure for everything. It is dangerous to eat Ginger if you are taking Beta Blockers,or have certain lung conditions.seek medical advice first. Good advice that many times gets lost with these so called miracle plants. I have been regular drinker of ginger’s tea. This is very powerful for stomach. I am interested in feeling better Naturally. through food, eating right. I have joint pain in my shoulders. Burning pain in my muscles neck area. I’d like to know if taking ginger in supplement form thats organically grown & excipient-free works. Each capsule contains 1,080mg. Any advice or something you can share on this, i would appreciate any feedback. Hi Lisa, when taking ginger in a concentrated form, like supplement, there is a need to consult with a doctor first, as ginger can interfere with certain medications, such as blood clotting medications and more. I’ve seen in webMD and Maryland Medical Center that the dosage of 1000 mg is used for arthritis and nausea for example (250 mg 4 times daily), but your doctor needs to establish the right dosage for you according to your specific situation. I would love to know if I can control type 2 diabetes naturally with herbs? Tired of drugs! My body does not like them anymore. Hi Joanie, you can refer to my article about the best foods to control diabetes – but this comes as an add-on to the current treatment. It doesn’t intend to replace it. I know that Ginger is related to Tumeric. I have a Tumeric bulb in my fridge now – will that work the same way for us as Ginger does? I take one teaspoon of ginger juice daily. ….very useful to control my diabetes. …. Great article, thank you. Someone mentioned that Beta-blockers and Ginger don’t go together, what do you think of this? I have been on 40 mg. Propanolol for years for Essential Tremor but now have chronic inflammation confirmed by my Neurologist. I am keen to start the ginger tea and would value your advice. Hi Theresa, I have read that ginger may interfere with heart medications, including beta-blockers, digoxin, and other heart medications. In this case don’t take ginger without your doctor’s advice. I grow up using ginger when we cook chicken,fish and beef,i used to think that it’s just something to give the food extra taste..
After reading this article,it finally made sense.you see i justturned 50 and just had my colonoscopy on may 31 2016 and the result was great.doctor said i dont have to see them again after 10 years. It was the ginger i guess.. Thanks for this lecture. Vcr informative. Buy what about tumeric? Which I call the tender brother but have other healingeffect does it have restriction as ginger? Yes, it’s best to get a “green light” from your doctor. I take 1 teaspoon of ginger with fresh under processed local honey every day and my husband does too. He has had colon cancer before and ginger is a great addition to helping to stave off any future occurrences. I take clopidogril/plavix is it ok to take ginger fresh or powder form. I saw in Rxlist website that ginger can interact with clopidogrel (Plavix). You will need to discuss it with your doctor to establish the right amount for you or if you need to avoid it altogether. I’m taking Metoprolol (a beta blocker), Anastrizole (an estrogen blocker… I had breast cancer), and Armour (for a low-fun toning thyroid gland. Is it okay to add ginger to this mix? I don’t know (I’m not a doctor). It’s best to consult with your doctor.